Fall is a great time to begin doing som fun and creative indoor crafts. As the weather changes outside you have more time inside, and more inspiration from all those beautiful changing colors! This month we want to share a colorful creative craft that will surely add some beauty to your home! Fall also brings great new food with the changing of the seasons. Beans are a great fall staple and come in a beautiful array of colors and sizes. Red beans, pinto beans, split pea, and many, many more! 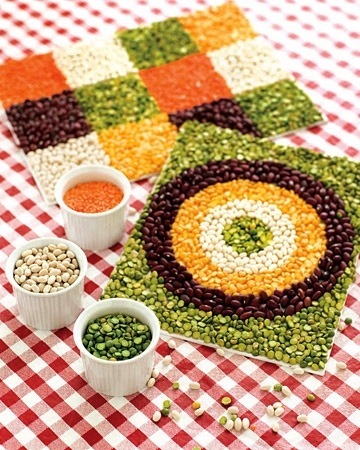 So why not use these beautiful beans to create some amazing mosaics. Martha Stewart has a great tutorial for some incredible mosaics. You can make turrets for your hot plates, decorations for the kitchen, or just a Great Wall hanging! Your kids can create amazing tiles that will be as unique and creative as they are. 1. Begin by drawing your design or pattern in pencil on the canvas board. Be creative draw a pattern, portrait, or landscape. 2. Use a small paint brush to paint a thin layer of glue on the canvas board. Then use your beans to fill in the areas of the picture, use a different color for each section. 3. Use your ruler to ensure your beans are edged well. 4. Complete steps 1-3 until picture is completely filled in. 5. When pattern is completely filled in with beans allow it to dry for 1 hour. Enjoy your beautiful bean mosaic! This entry was posted in Activities and tagged bean mosaic, crafts, fall crafts, martha stewart, the boys store on November 4, 2013 by Lacy.